See also: part one of our look at the Best Banking Apps, featuring Lloyds, Santander, NatWest, First Direct and more. As part of this year’s British Bank Awards, a new category we’ve added is “Best Banking App”. This reflects that apps are becoming one of the more important and commonly used channels of contacting their banks. Our reviews show that currently, 83% opting to use an app or website vs. 17% who prefer telephone or in branch. In Part Two of our “Best Banking Apps” guide, we look at the apps from ten more large UK banks, and rated them in terms of functionality, performance, and ease of use, according to our community, and our innovation experts here at Smart Money People. Want more app content? This piece relates to current accounts only, but read our blog on awesome up and coming personal finance apps ( part one, and two), or take a look at our British Bank Awards 2017 “Innovation of the Year” shortlist. What we loved: Pingit, Cashback offers, both Apple Watch and iPad apps, mortgage management - the app has it all. There’s even some degree of personalisation within the app - account nicknames and images, something Atom Bank touted as a new feature when they launched. Could be improved: We rated Barclays highly for innovation too, and customers have little to complain about with the app. One thing which confuses customers is that although Barclaycard and Barclays are two separate companies, people still want their products managed within one app - like most other banks will. We're not sure if this one will ever be rectified, but it's understandably frustrating. What we loved: Metro Bank have languished behind the high street banks, with a pretty poor app for a couple of years. Just this week, they've released an all new version, with budgeting assistance, TouchID, payee management, blocking of lost cards, so the Metro Bank app has finally caught up to the best apps out there. Could be improved: Having left customers in the dark since 2015, the new app has some of the bells and whistles you'd expect in a 2017 banking app, but still lacks some of the really cool functionality that even the likes of Tesco Bank offer. With Metro going to the effort of rewriting the app, it seems likely that they'll add in all of those things users expect in coming updates. What we loved: Despite Smile calling themselves “The internet bank”, their offering does not reflect the digital world in 2017. The Smile Bank app is also exactly the same as what Co-operative Bank customers get, just with a splash of pink. There is some customisation available, but in terms of raw functionality and customer experience, it’s not a great effort. Could be improved: Customers report long lags in transactions being updated on the app, which defeats the purpose of having instant access to your statement. Direct debits, payees, standing orders, online messaging - all things which can’t be managed using the app and require a desktop computer. A long way to go to catch up to even some of the more basic high street banking apps. What we loved: the ability to set up a low, medium, or high balance alert is a simplified, but useful way to keep watch of your balance. There’s a branch finder, and your usual functionality but other than that, Clydesdale and Yorskhire aren’t pushing the boundaries of what a current account app can really do. Could be improved: There's not much modern tech support - think TouchID, iPad apps, etc. Even adding the ability to view Direct Debits from within the app would be an improvement. Worst of all, the app doesn't seem all that stable, with many users being unable to consistently access the app. What we loved: Tesco Bank are obviously on the ball when it comes to their app efforts. Cutting-edge features like “Balance Peek” (above), 3D touch support, transaction search, TouchID, and an Apple Watch app make this a feature-rich, easy to use effort from the supermarket bank. You can even access your banking documents, like your annual interest statement from within the app. Could be improved: The app gives customers an excellent method of interacting with a range of accounts and offers all of the functionality available from any of the other banks, so it's an excellent all-round effort (barring their record-breaking 2016 security breach) from Tesco Bank. What we loved: Whereas Smile Bank is nothing but a pink version of the Coop Bank app, Clydesdale & Yorskhire have rewritten their B Bank app from the ground up. It’s on-brand and has a modern feel which many of it’s competitors do not. Saving pots is an incredibly useful tool, and account "sweeping" - essentially topping up one account when it gets low, is an interesting take on budgeting assistance. Could be improved: Although it looks the part, there's still a lot that could be improved. Customers comment that the overall performance of the app is slow, which can be extremely frustrating. 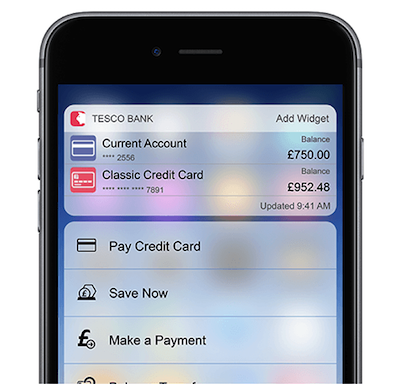 And though there are some useful features, there isn't that use of hardware such as Force Touch which others now employ to great effect (Tesco Bank and their balance view from the home screen, for example). What we loved: It’s red. It has the basic functionality you’d expect - move money between accounts, make payments to people already authorised on your account, find a branch...but that’s all. Zero bells and whistles. Could be improved: See any of the features which Tesco, Barclays, or NatWest have added to their main banking apps. The app hasn’t been updated since late 2015, so any further improvements would be most welcome if the Post Office Bank want to be taken as seriously as the other large banks. Virgin Money, Sainsbury's Bank, and Marks & Spencer all have yet to launch a banking app for their current account. 20 banking apps from the largest UK banks - which have you used, and which did you love? Do you love Tesco Banks' peek, or HSBC's fast balance, or does using the Co-op Bank's app just frustrate you? Let us know, and help crown the "Best Banking App 2017"